Caitriona Ruane has just admited to the BBC’s Good Morning Ulster taking her daughter out of school in term-time to join her on a taxpayer funded trip to Cyprus. Mr Smith said: “In particular, the survey highlights that the engagement of teachers with CfE is highly variable across the country. “While this is improving, there remains a substantial minority of teachers and lecturers who do not feel fully engaged with CfE. Other concerns raised by Mr Smith included a lack of time for staff to work on CfE development and a “stark lack of funding to support the most ambitious programme of curricular change in a generation”. No such qualms from the various Northern Ireland teaching unions who have swallowed CCEA’s curricular changes whole. It is a shame that none of the expert educationalists could have written a letter of this relevance over the past ten years. Perhaps the Emperor has been naked for a decade. I have met with the Children’s Commissioner on a number of occasions on various education issues, and the issue of post-primary transfer was discussed at a recent meeting on 19 February 2009. 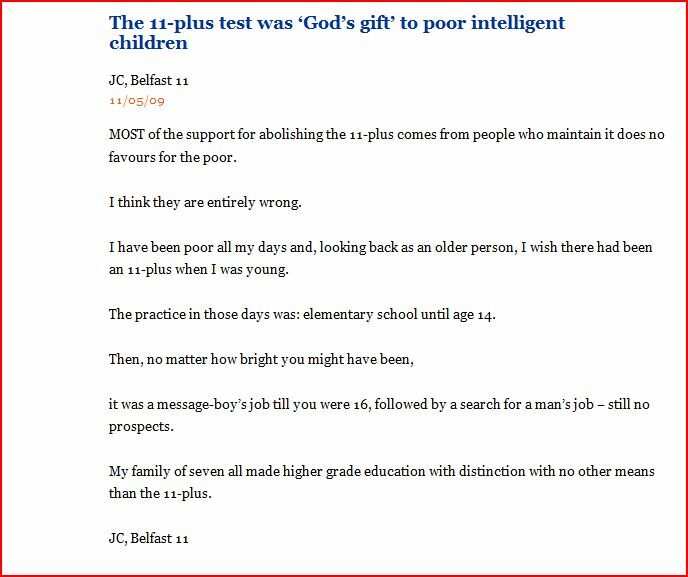 The issue has also been raised in correspondence with the Commissioner and I support her view that “selection of children at 11 does not work”. 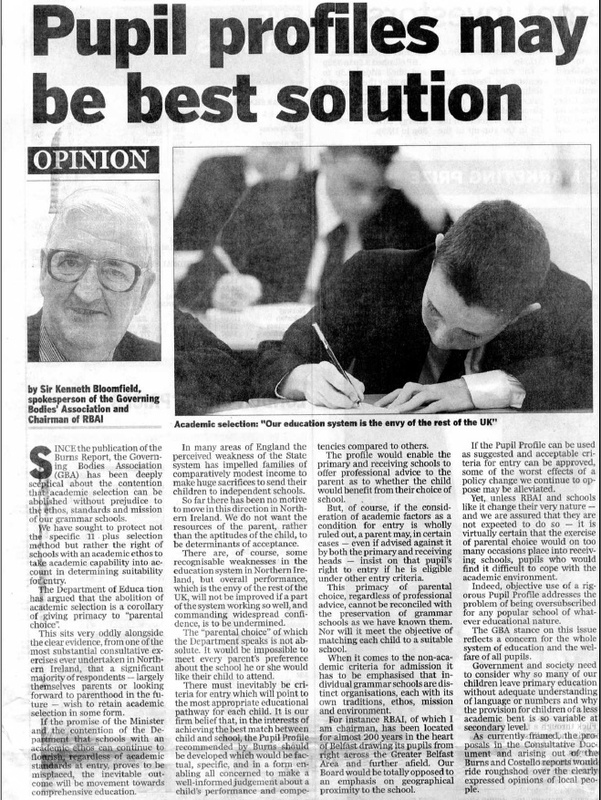 Coleraine High School will use the Association of Quality Education’s CEA test as a device to take the school comprehensive. Perhaps Anne Bell should learn the distinction between a mark and a grade. PACE would welcome a response from any headteacher specifying the mark obtained in the 11-plus for a pupil awarded a C grade by CCEA. One of the primary claims of concern over post-primary reform by the educationalists was that structures (schools) were not placed before the needs of pupils. Anne Bell represents the epitome of self serving platitude expressed in her attempt to disguise the announcement of the death of a grammar school. See will simply declare it so. Mr A McQuillan (AQW 7094/09) asked the Minister of Education if she can give assurances that the Education and Skills Authority will not interfere with the running of successful schools. The Education Bill will provide a new administrative structure to support the raising of standards in all schools. It is my intention that the Education and Skills Authority (the ESA) will assist schools in achieving significant improvement in the achievements of all pupils. The arrangements being established will see local area support teams working with schools, reflecting the individual needs of each school. It would not be appropriate to characterise this relationship as one of interfering. I will also ensure that my policy of Every School a Good School will mean that all schools will be seen as successful. Parents will feel so much better knowing that Caitriona and the ETI refuse to name any failing schools. The hugh number of pupils leaving second level education without qualifications in numeracy and literacy is either of no concern to the Minister or she is talking more nonsense. The fact that English and Maths are no longer compulsory subjects at GCSE makes her promise to improve results impossible to measure. If this lack of willingness to be measured seems familiar then her vitriolic attack on the unregulated tests in numeracy and literacy put her real objective into perspective; the destruction of grammar schools. In her latest attempt to cajole and bully parents into compliance with her “guidance” Education Minister, Caitriona Ruane uses another compliant group of Catholic principals to reinforce her/their mistaken view. Education Minister Caitríona Ruane said schools should follow her Department’s guidance and not set their own tests. “It is obvious that the grammars have not considered the needs of primary six children or the impacts these unvalidated tests will have on them, but are more interested in simply preserving the archaic system of academic selection,” she said. 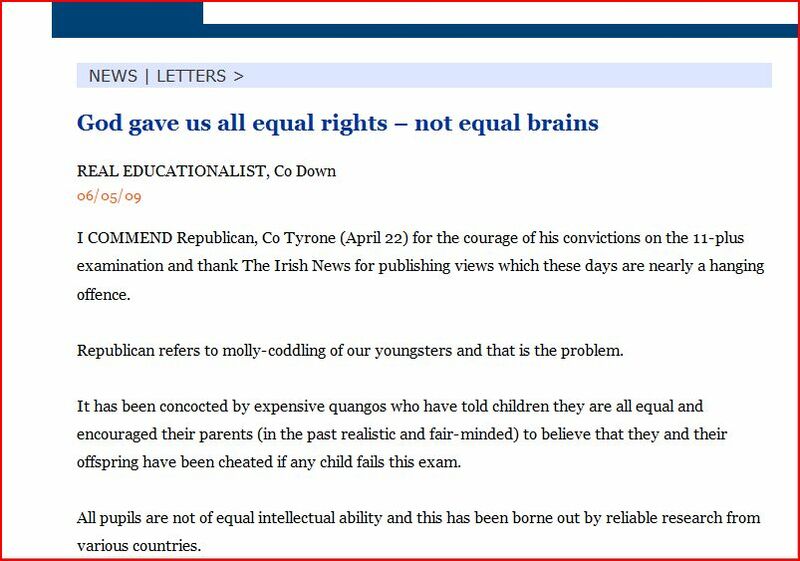 Perhaps Ms Ruane has failed to read her own Equality Impact Assessment. It admits discrimination against Protestants and non-Catholics and is therefore illegal under equality legislation. Her consultation on the EIA is therefore a waste of public funds.